Patrons are allowed to use the phone to call for a ride. Phone is NOT to be used to call for forgotten items or to call friends. Patrons will be moved into the bathhouse during lightning, thunder, and rain. According to the National Lightening Safety Institute (NLSI), we must wait 30 minutes after the thunder and lightning stop entirely before letting patrons get back into the water. The manager on duty will notify lifeguards on duty of the weather situation. If a tornado watch is issued, relay the information to everyone in the facility so swimmers may start home or use the phone to call for a ride. 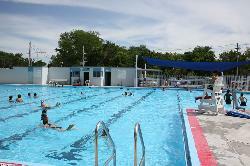 Patrons can seek shelter in the pool bathhouse for safety. In case of a tornado warning, guards will clear pool immediately. Generally, there is 3 minutes after a warning is issued before a tornado hits so it is very important to be able to guide occupants to the designated shelter area as quickly and efficiently as possible. Guards will blow their whistles to gain the attention of the patrons, and announce that they have to clear the pool immediately due to a tornado warning. It may not be possible to move all occupants into this area so it is necessary to be aware of specific things to AVOID if the shelter area cannot be reached. Children under 8 must be supervised by an adult or caregiver at all times. The caregiver must be at least 14 years of age. Children 4 years old and under, as well as all non-swimmers, must be within arm’s reach of a supervising adult or caregiver at all times. The caregiver must be at least 14 years of age. Lifejackets/floaties of any kind indicate the child is a non-swimmer. Ten-minute rest breaks will occur every hour. Patrons should use this time to sit and rest away from the edge of the pool. If you are 18 years of age or older, you may remain swimming. If you have a grievance, follow the link below to report to the City Administrator.